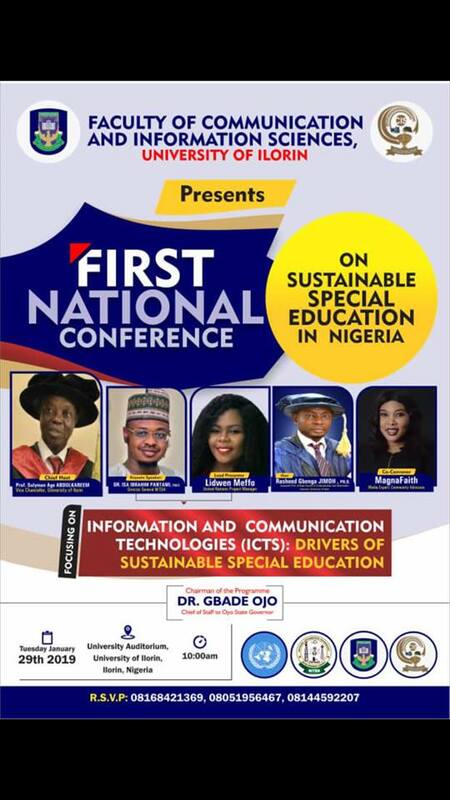 The Faculty of Communication and Information Sciences, University of Ilorin, will hold its First National Conference this Tuesday (January 29, 2019). The Conference, themed “Information and Communication Technologies (ICTs): Drivers of Sustainable Special Education”, will hold at the University Auditorium by 10:00a.m. A statement by the Dean of the Faculty, Dr. Rasheed Gbenga Jimoh, disclosed that the Director General of NITDA, Dr. Isa Ibrahim Pantami, will be the Keynote Speaker. The statement added that the United Nations Project Manager, Lidwen Meffo, will be the Lead Paper Presenter while the Vice-Chancellor, Prof. Sulyman Age Abdulkareem, will be the Chief Host and the Chief of Staff to the Oyo State Governor, Dr Gbade Ojo, will be the Chairman of the occasion. Members of the University community and the general public are cordially invited.